The fifteenth Istanbul Biennial has announced that its thematic concern, “A Good Neighbour,” will address the notions of homes, neighborhoods, and modes of living in the private and public spheres as well as how they’ve changed throughout the past decades. A performance involving forty people asking questions about what constitutes a good neighbor kicked off a press conference that the biennial held this morning. Artists Michael Elmgreen and Ingar Dragset, who were selected earlier this year to curate the exhibition, discussed the biennial’s format and introduced its billboard campaign, which was created in collaboration with graphic designer Rupert Smyth. The artists will work with institutions worldwide to put up billboards featuring images and text related to being a good neighbor beginning in March. 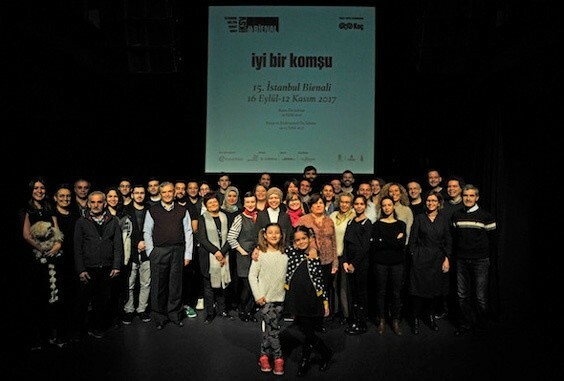 Elmgreen told Gökcan Demirkazık of artforum.com that they were quite surprised when the biennial asked them to curate the show, after having solicited a proposal from them. He said: “If you dare to let us, we will do it.” The biennial will be held from September 16 to November 12, 2017. GÖKCAN DEMIRKAZIK: In previous exhibitions such as “Tomorrow” (2013–14) at the V&A and “The Collectors” (2009) at the Danish and Nordic Pavilions of the fifty-third Venice Biennale, you have created fictional domestic environments to reflect on capital, social structures, and alienation. This time, you have a domesticity invoking title: “a good neighbor.” In what way will your interest in the concept of “home” materialize differently? MICHAEL ELMGREEN: This time, it is almost a strategy for us to look at things at a micro-level in order to look out at a bigger perspective, and speak about the neighborhood to speak about coexistence in a broader sense. Also about the home—our private sphere—as a vehicle for self-expression where we dare to live out our identities in different ways than when we are in public. INGAR DRAGSET: There is less focus on the home as a metaphysical dwelling. The title is pointing more toward human exchange or the lack thereof.